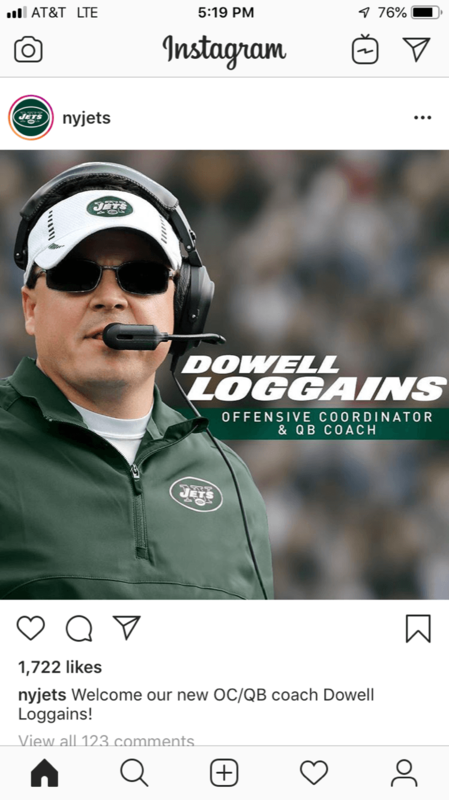 Dowell Loggains, the new New York Jets’ offensive coordinator and quarterbacks coach, has hung on to the same cell phone number he was given during his freshman year of college at the University of Arkansas. 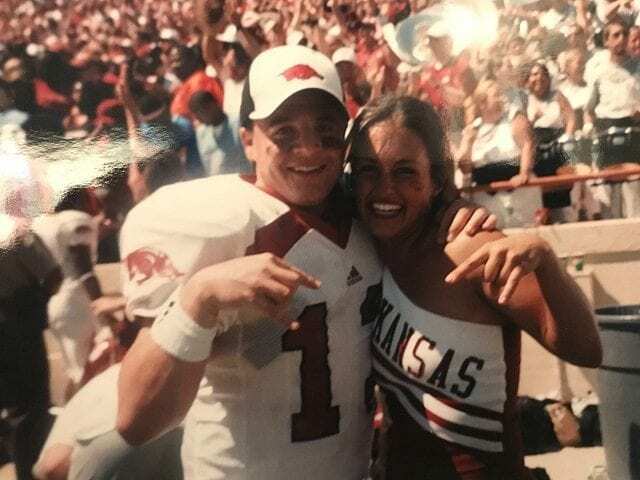 And he’s still happy – anytime, anywhere — to call those Hogs. The same goes for his wife, Beth, also a U of A alumna, and their three children, ages 9, 7 and 2. Baby No. 4, their third girl, is due in July. She’ll also be a Razorback supporter, they suppose. “They’ve all become little Razorback fans,” Loggains said, a smile in his voice, along with the slow Southern drawl that’s also stuck around. 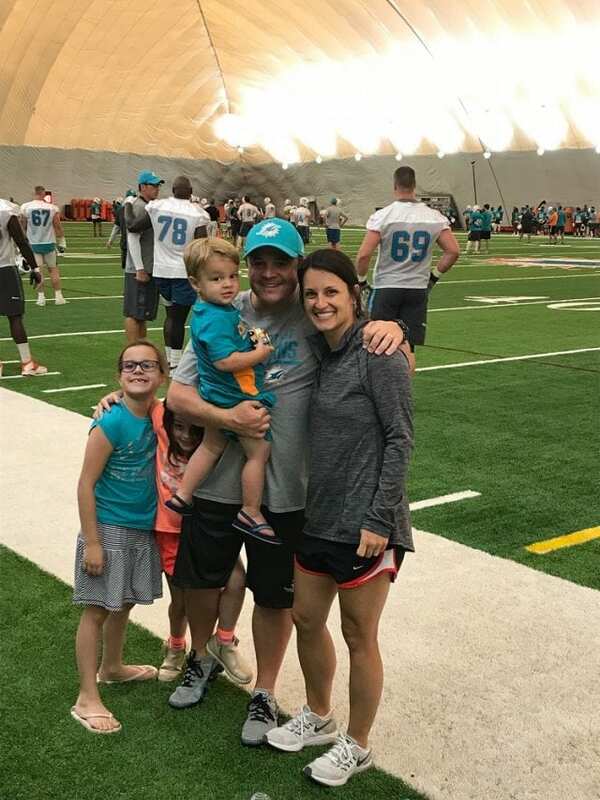 Loggains and his wife, Beth Burnett Loggains, met while on a trip to the 2000 Las Vegas Bowl. 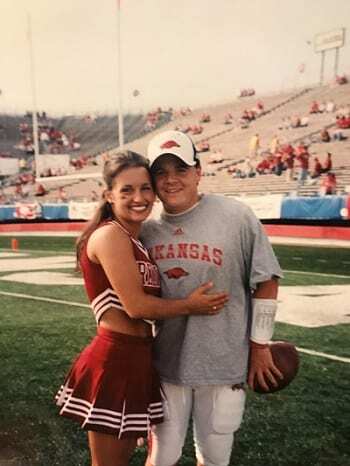 Loggains was a redshirt freshman and she was a UA cheerleader. Loggains spent four seasons as a backup quarterback and place holder at the U of A. He recounted the glory of winning the 2002 SEC Western Division – one of his most prized possessions is the ring they all snagged that day – at the first “Miracle on Markham” win against LSU. Since he hasn’t lived in the area for many years, those relationships are often maintained through phone calls and texts. Lots of texts. Especially during a Razorback football game. Loggains said if he’s traveling with the NFL and there’s a Razorbacks football game happening that day, he’ll typically turn on his phone to find a lengthy group text trail among his Fayetteville friends. If he recorded the game to watch later, he’ll usually save the mountain of texts for later to avoid spoilers. Loggains was born in Newport, Arkansas, but his family moved to Dallas when he was a toddler. They moved to Abilene, Texas, when Loggains was in third grade. He was the quarterback at Abilene Cooper High School before being accepted to the UofA. Loggains graduated with a bachelor’s degree in kinesiology and a master’s degree in education. Beth Loggains, originally from Bryant, Arkansas, graduated from the university with a kinesiology degree as well (his emphasis was in K-12 and hers was in pre-professional) then went on to earn a Doctorate of Physical Therapy from Belmont University while living in Nashville when Dowell was with the Tennessee Titans. UA kinesiology professor Sharon Hunt had Dowell Loggains in her Administration in Physical Education course in the early 2000s. He was a stand-out student, she said. “Even as an undergraduate student, he was professionally motivated and possessed a solid work ethic,” Hunt said. “Our entire department is very proud of his noteworthy professional accomplishments, and prouder still of the fine man he has become. I often cite Dowell as an example to my undergraduate students, pointing out that hard work and networking opportunities can often lead to professional success. Dowell Loggains started his pro football career as a scouting assistant with Dallas in 2005. He spent eight years with the Titans in several roles, including offensive coordinator from 2012-13. For the 2014 season he was in Cleveland as the Browns’ quarterbacks coach before being hired by Chicago. 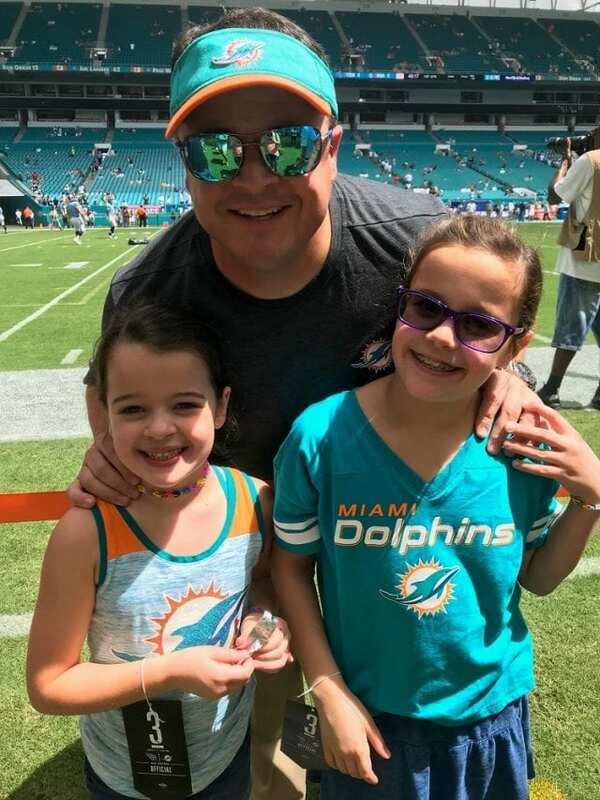 Loggains was the Miami Dolphins’ offensive coordinator in 2018 before being hired by the Jets in January. He and the other Jets coaches recently made it through free agency, he said, the time period when a player’s 4-year NFL contract is up and they’re free to move to – or be stolen from – other teams. “I’m pleased with the players we were able to sign on,” Loggains said. He noted that spring practice will start in late April, but June and July will offer a respite for everyone – and offer a little downtime for the coaches and players to be with their families. Baby No. 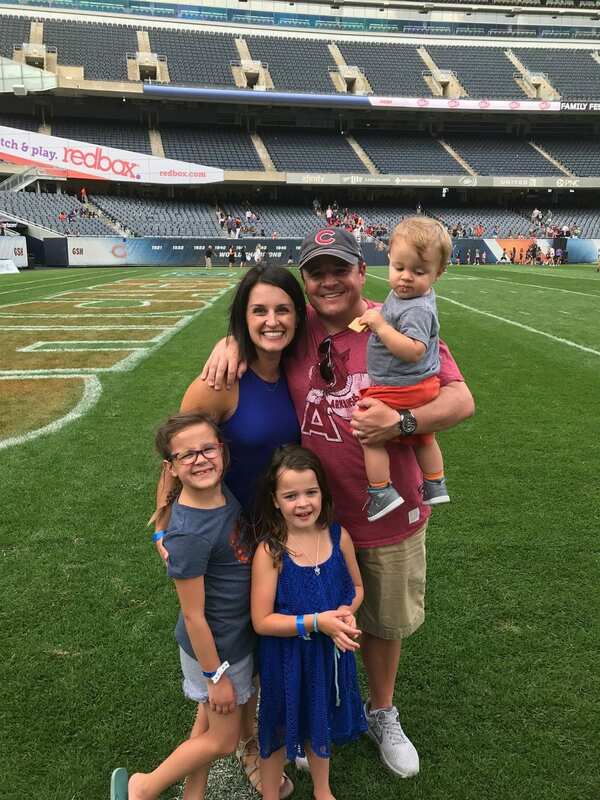 4 (the first three Loggains kids call her “Jelly Bean”) is expected to arrive on July 8. Loggains said he’s glad she’ll be an “off-season” baby. That will make two off-season and two on-season babies, he said. But first, the rest of the family has to move to New York. Beth and the kids are still in Fort Lauderdale, soaking up the sunshine. Loggains said they’ll all have to get used to the cold weather again. He said his family is highly adaptable, though. 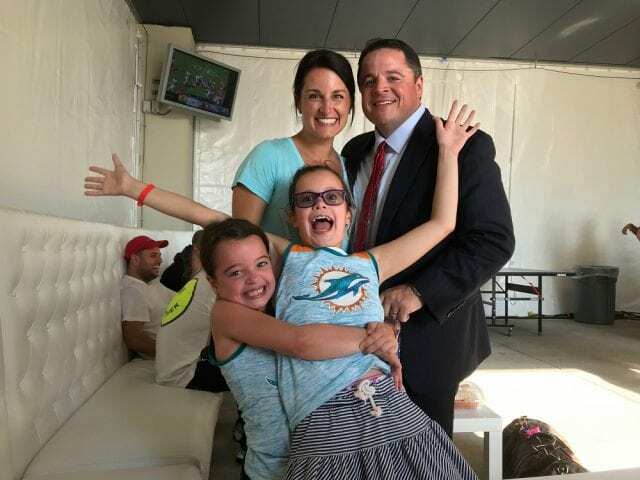 Loggains said his wife often has to operate like a single mother and he gives her major props for taking care of the kids so well, not to mention navigating all the moves they’ve made. “She’s an incredible mom,” he said. Beth is currently trying to close on their house in Fort Lauderdale so she and the kids can move to New York. “This is our seventh move, not counting coming from Arkansas and Texas,” she said. “Navigating the logistics is the hard part, but moving to a new place also means we get to meet people we didn’t know we’d get to meet. Beth Loggains said coaching is a calling for her husband, while pediatric physical therapy is hers. When their first two children were young, she was able to work in the field at a clinic which had a preschool on campus. She plans to get back into the profession after “baby girl” is born and gets a little older. That might be in New York, or maybe a new city. She said it’s not always easy being married to an NFL coach, but it’s always an adventure. Beth Loggains said she ignores her husband’s inevitable critics. He’s more resigned. “That’s just part of it,” he said with a little laugh. “When you’re winning, it’s great, but when you lose, those passionate fans can go the other way. As a big fan of sports of all sorts, Loggains said he understands that passion. But he sympathizes with the coaches and doesn’t fault them when a team loses. “I have a great appreciation for all coaches in all sports,” he said. Loggains said when it comes to winning or losing, he focuses on having a solid work ethic and putting in the time. He sees his ultimate goal as a coach to help each team member play to his potential. The best part of coaching life is celebrating a win in the locker room, he said. Loggains said he’s always been fortunate to have good head coaches who make sure families feel included. He looks forward to that experience in New York. Loggains tries to get back to Arkansas on occasion. He was in Hot Springs for a high school football clinic last year. For 12 years straight, he was able to visit Fayetteville, but broke his streak a few years back when life got too busy. Regardless, the area – not to mention the Razorback team – will always be special to him. When asked if he thought his kids might go to college at UA, Loggains didn’t rule it out.